It is spring, and the sun comes out in all its splendor over Barcelona. Birds go into business and flowers in the stalls along La Rambla de las Flors indulge in their particular beauty contest. Lucky tourists who managed to win the weather lotto go like crazy up and down the promenade. Time for Barcelona street artists to work extra hours. After assuming I had seen them all, I have to accept the inevitable truth, they clone like Molly. 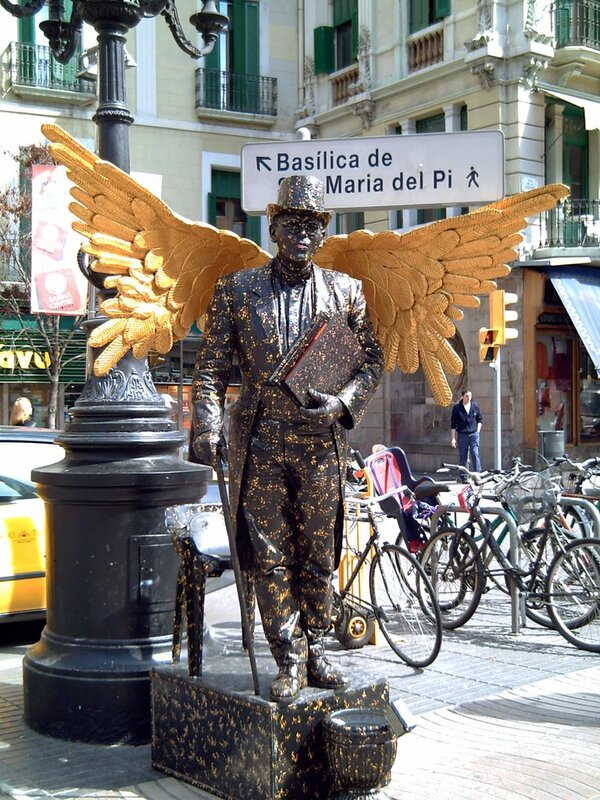 See this elegant gentleman spreading his wings while holding tight his records of financial transactions. wow, I like to see these artists in person very much. Hope they come here in Akita and have a festival or exhibit. Everybody would love them! Your street artists have a lot of creativity with all these different ideas they present! It's not easy standing in the same position for hours until someone throws you some money. huh? this man is real ???.. wow !! so very talented ! >midnitebara -It would be very hard for them to go there as it is already hard to make a living here. I don´t think they have money enough to travel often. >Nicola: For me it is one of the main attractions at Las Ramblas. >Bob: You are right, not everything can be seen through rose-colored glasses. >Did you see that?. He must take hours to make up.